A showdown at the icy gates of civilization! Father Frost has gone missing and Krinnleton face explosive turmoil from within. A band of newly-arrived adventurers offer hope that the nefarious forces from the north may be routed. But the magical dome around the elven town crumbles and the might of the vile Avalanche Lords strengthens! 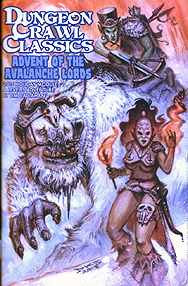 The heroes must survive their journey through the icy wastes, past the hideous shiver serpents, beyond the edge of the snowy peaks to the old woodman's lava-drenched workshop. Only then might they defeat the marching mammoths wielding the pulsating polar energy of the terrible Celsion Engines!